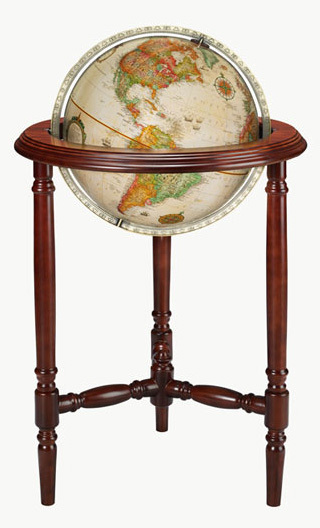 The Stevens Floor Globe has a stately presence that's perfect for your library, office or lobby. The hand-turned legs and detailed top ring feature a rich walnut finish. The antique brass-plated full meridian complements the off-white oceans and traditional color scheme. Raised relief provides a realistic perspective of our world. Replogle's Stevens Floor Globe is backed by a one-year warranty.